This week, I chose to iterate on my original nametag assignment, pictured below. 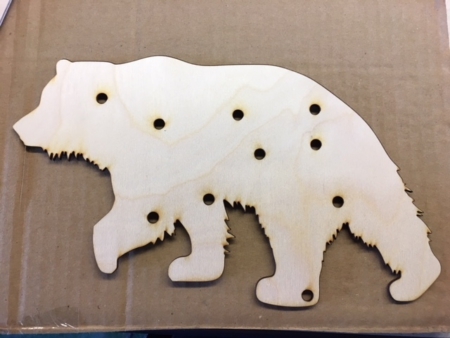 I enjoyed working with the laser cutter the first time, and felt that I could design something more aesthetically pleasing now that I had more experience in Inkscape. The Difference, Union, and Exclusion tools we learned during the sticker unit were very helpful during my design of this project. I also wanted to try my hand at painting the birchwood. 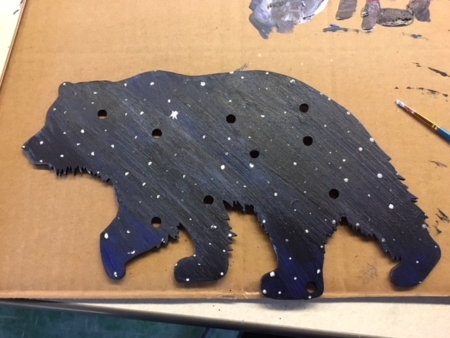 For my design, I decided on a Trinket-powered twinkling LED constellation inside the shape of Ursa Major, the bear. 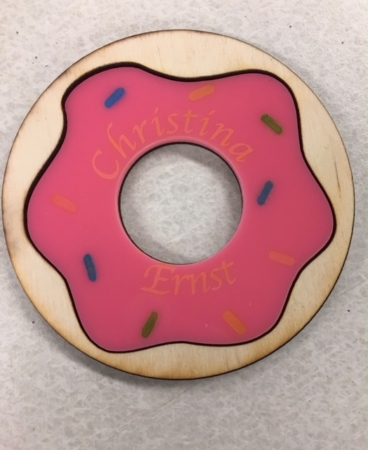 Although this was an iteration on the nametag and used many of the same tools, I chose not to include my name, as I wanted to make a decoration I would actually hang up. This was exciting for me, since it felt like the first project I had gotten to completely design with almost no restraints. 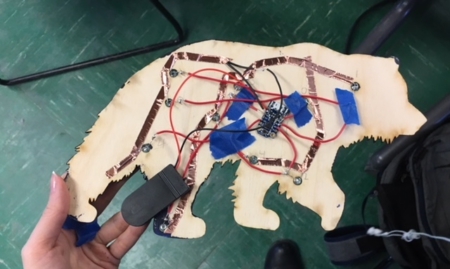 I had never worked with a Trinket before, but was able to build off my knowledge from the Arduino week. The Trinket has five pins, and I decided to use all five of them to power ten LEDs. This would allow me to fade five sets of two LEDs in and out at different intervals from one another, apparently randomly. During the paper circuits assignment, I learned that working with copper tape was significantly easier, cleaner, and flatter than soldering wires to LEDs. I couldn’t do all my power wiring with copper tape, since I had five sets of LEDs in parallel, and the tape would’ve crossed over itself. However, I did all the ground wiring with copper tape, and it saved me a significant amount of time and wire. Alternatively, if any of my classmates plan to solder for their final projects, I highly recommend using the helping hand clamps to hold your pieces steady. They saved me a good deal of time and headache. I learned a lot from the iterative part of this project, Inkscape design, now that I had more design knowledge at my disposal. Unfortunately, since I was not iterating on the Arduino portion, I ran into some unanticipated issues with power draw. Two of the Trinket pins successfully light up their LEDs, but the two coin cell battery packs cannot light up all ten LEDs in their current configuration. For the final version of this project that I’ll keep in my apartment, I’ll most likely revamp this project with one long, parallel circuit, and remove the Trinket interface. This will allow me to power all the LEDs in parallel. After the video was taken, I also sanded down some of the LED surfaces so that the light wouldn’t be quite as blinding. In conclusion, I’m really glad that this assignment was part of the curriculum. I enjoyed being able to come up with my own process and figure out the materials and procedures I needed to use for it.